Pepsi will donate a portion of the proceeds of every Pepsi product sold in Hospitality Services locations through May 3 to the Pink Ribbon Girls, which assists people with breast cancer and gynecological cancer. 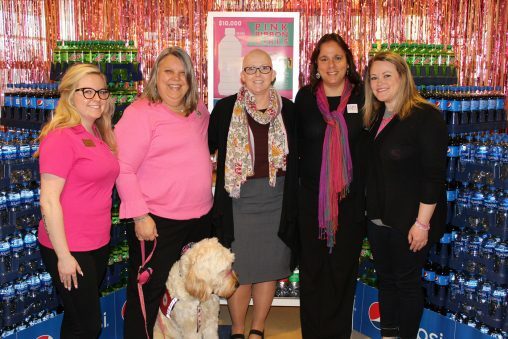 Wright State’s Hospitality Services has partnered with Pepsi and the Pink Ribbon Girls to raise money for assistance for people going through breast cancer treatment and recovery. The goal of the fundraising campaign is $10,000. The campaign runs through May 3. For every Pepsi product sold in any Hospitality Services location at Wright State through May 3, Pepsi will donate a portion of the proceeds to the Pink Ribbon Girls. The campaign began with a kickoff event in the Student Union Market, where representatives from several Wright State organizations and the Pink Ribbon Girls shared information about breast cancer as well as helped to express support for Provost Sue Edwards, who is undergoing treated for breast cancer. “We are very confident the Wright State community will come together and help us reach our goal,” said Haitham Shtaieh, executive director of Hospitality Services. Members of the Zeta Tau Alpha sorority also participated in the kickoff, helping to raise awareness for breast cancer and to advocate for resources for survivors and people who are currently affected by breast cancer. When Chartwells and Pepsi approached Edwards with the idea of a fundraiser, she said she wanted the money raised to stay local. She chose the Pink Ribbon Girls as a charity. The Pink Ribbon Girls is a Dayton nonprofit organization that assists people with breast cancer and gynecological cancer. The organization’s motto, “No One Travels This Road Alone,” is exemplified through its services, including providing transport to and from chemotherapy treatment, providing healthy meals for those who cannot cook for themselves, cleaning the homes of patients recovering from surgery and providing peer support for patients who need emotional support. Edwards said she was overwhelmed by the support she received from the Wright State community during her treatment.